As far as I know, the biggest farmers of strawberries in our region are the Zetler’s. These family run farms dot the Stellenbosch region and they have three stores from which you can purchase fresh strawberries. You can also go strawberry picking if you want to which is something I have done once. But, I prefer less hard work when choosing my strawberries, and so I usually just buy them by the punnet. We are able to get strawberries year round due in part to our climate and also due to the growing conditions, but I must say that to me summer spells strawberry season and so I usually only buy them when the weather is hot and I know they have been grown outdoors. We get a few varieties here and I prefer the plump bright red strawberries. They need to be sweet enough to eat alone, and they must not be squishy. I will not eat frozen strawberries, but they are often in the frozen berry mix I buy which in turn is made into jam. Last December I bought myself the Kitchen Aid Ice Cream Churner attachment. It has been the most used of all my attachments to date and the only reason I have taken a break from sorbet making is that I am testing other dessert recipes at present and one dessert a day is enough. 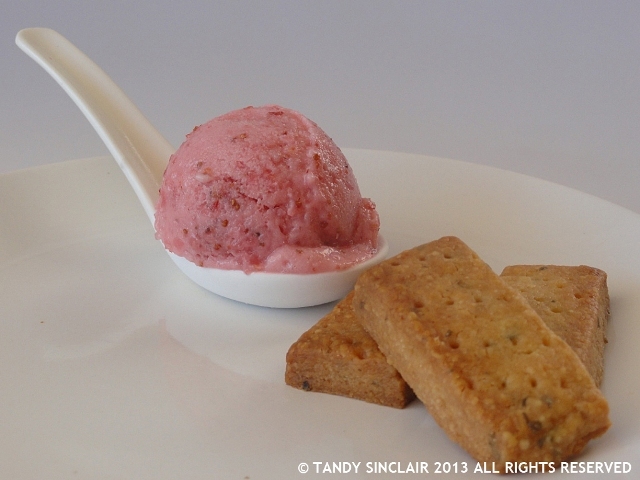 This sherbet went down a treat and worked perfectly well with my basil shortbread. I ate so many strawberries this season and I want more 🙂 It looks delicious. there can never be enough strawberries! I have the same attachment and I use it a lot during summer! I was thinking of getting the meat grinder attachment but I don’t know how much I’d use it. Mmmmm, lovely! Oh how I love berry season! Tandy, I have been absent, I apologise; life has been a little hectic. But what a treat to arrive back to. This recipe I will try soon! It looks wonderful, and perfect for an English Summer (when it arrives). Tandy, it’s 9 degrees C outside today in Sydney, I’m sitting here with so many layers on shivering and yet I can’t help but crave this right now! Yum yum yum! I almost licked my screen! I love strawberry-flavored treats. I experience that quite often on your blog! Such a lovely recipe and great combination with your shortbread. My favourite flavour – and what a stunning photo!